I’ve mentioned several times that I have a hard time throwing out glass jars. I don’t know why, but I always think I can put them to good use, so I hold on to them. I have a cabinet full of everything from big pickle jars to small salsa jars. It’s just so easy and convenient to embellish them and use them as vases, candle holders, pencil/pen holders, desk organizers, etc. 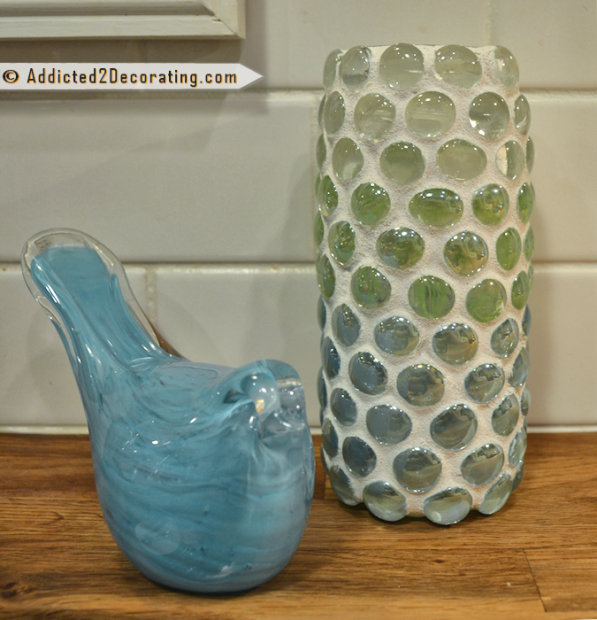 One of my very first projects that I ever did for my blog was a glass marble vase made from a mayo jar. Ever since then, I’ve wondered what it would look like to grout in between the glass marbles. So I decided to give it a try, and I really like how it turned out! 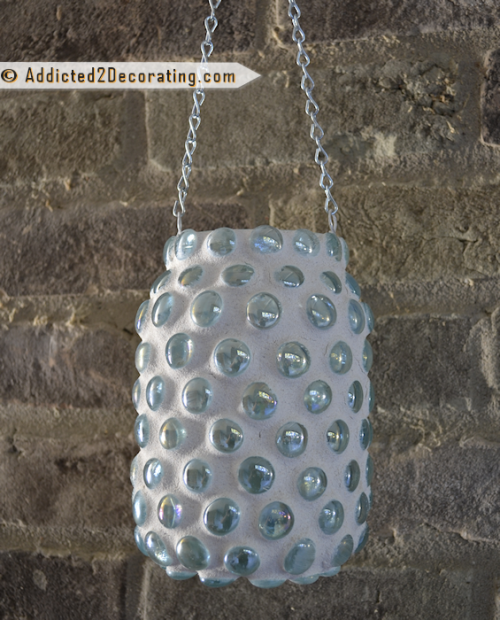 My original idea was to use it as a hanging lantern with a candle inside that would shine through the glass marbles. Turns out that a candle isn’t really bright enough to make the impact that I had hoped for. I would imagine that a small strand of battery powered lights would do the trick, but I didn’t happen to have any on hand. So instead, I turned my attention to making a little grouted glass marble vase. The process is quite simple. 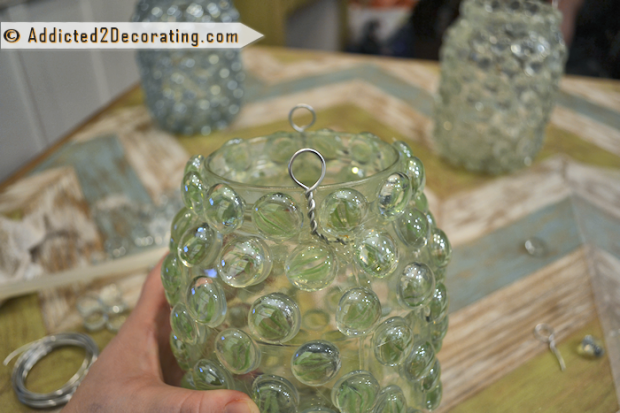 Start with a clean glass jar, decorative glass marbles (the kind that are flat on the back), and a hot glue gun. 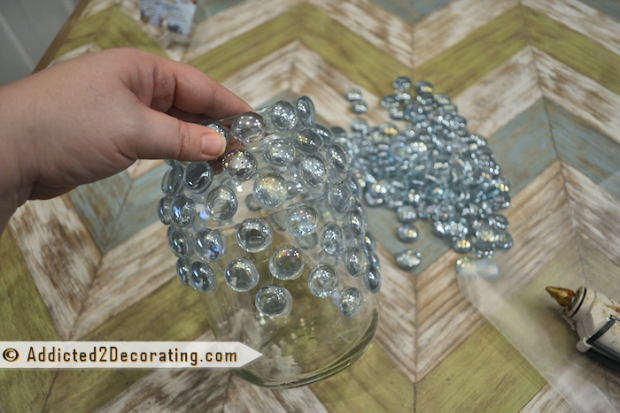 I hot glued the marbles to the jar using plenty of hot glue so that no bubbles or voids would show through the glass marbles. Since I originally wanted to make hanging lanterns, I used some craft wire to make hanging doodads for the sides so that I could attach a chain. I hot glued these directly to the jar. And then, I grouted. 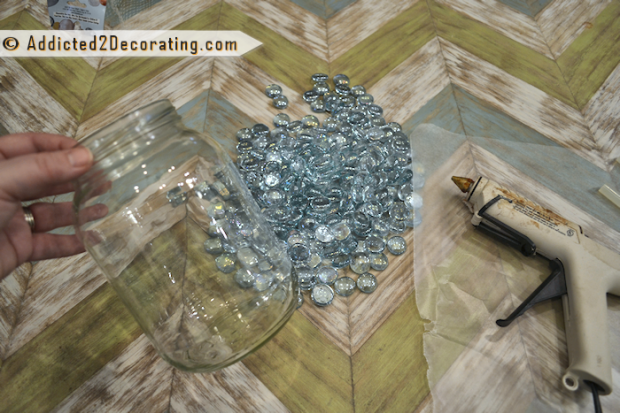 I placed the jar upside down onto a drinking glass to make it easier to turn while grouting. I learned that the bigger gaps between the glass marbles made it more difficult the grout. So when I used the smaller jar to make a vase, I placed the marbles right next to each other, and grouting was a bit easier. On the lantern, I attached a small chain that I purchased at Home Depot. I’d really love to see how it looks at night with a small strand of lights inside. 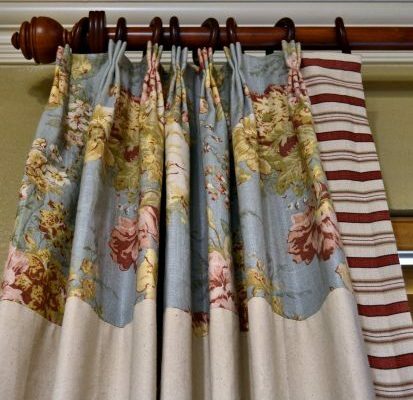 I can imagine using several of them on a covered patio in the spring and summer. But I definitely liked the little vase better. 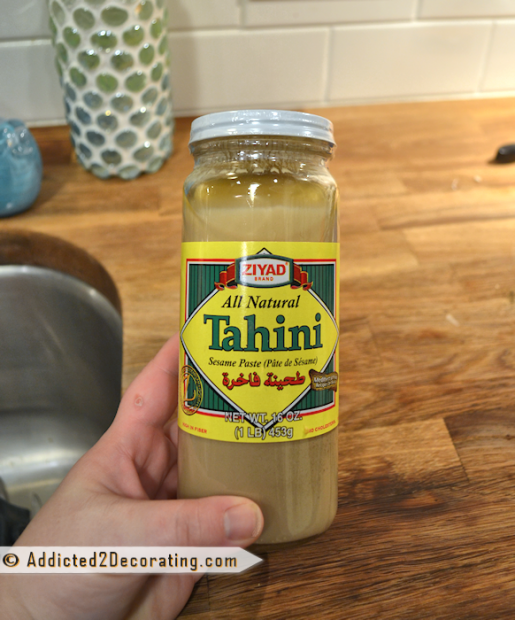 I used a tall, skinny tahini jar for it. I think I’ve purchased olives in a similar jar. 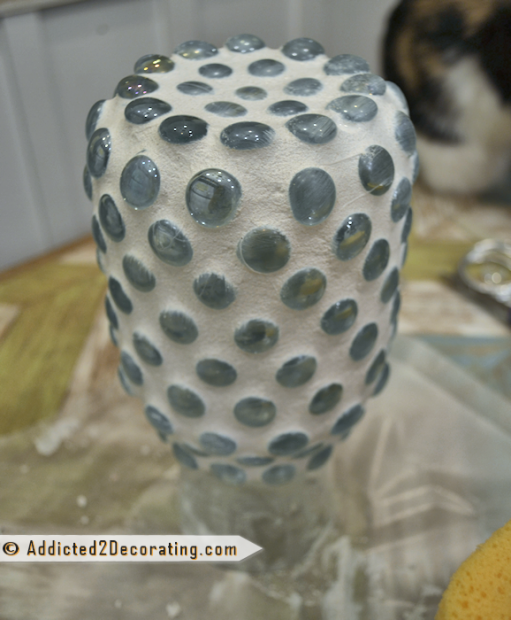 On the small vase, I also decided to mix the colors of the marbles, starting with white at the top, green in the middle, and blue at the bottom. I really love how the light plays off of the marbles. It’s really more beautiful in person. I couldn’t quite capture the effect in a photo. And of course, it can be used as a candle holder also. But you can see here how the effect isn’t quite as dazzling as you would hope. I wanted the whole thing to be lit up, but that’s impossible to do with a tiny little candle. I think in the spring, I might give this another try with the bigger jar/lantern idea. And right now is the perfect time to get my hands on some tiny strands of battery-powered lights! Next Post A Shameless Plug...Because I Want A House! These came out great! Love creative projects that recycle and use up left over supplies. Both look fabulous. They look pretty nice in the photos, but I can imagine how nice they look in person. They would make great gifts! These look awesome! I can’t wait to try one myself!! I’m wondering if there are any smaller types of glass flat stones though, and if so, maybe use a smaller jar, the smaller rocks real close together, and you’d have an easier time grouting as well as a tea light being able to shine through better with less space it has to get through? This is an awesome idea! You are so creative! These are absolutely so cute! You did an awesome job and it’s so creative! that looks like a fun idea. I would love to see it with the strand of lights in it. I love this idea! 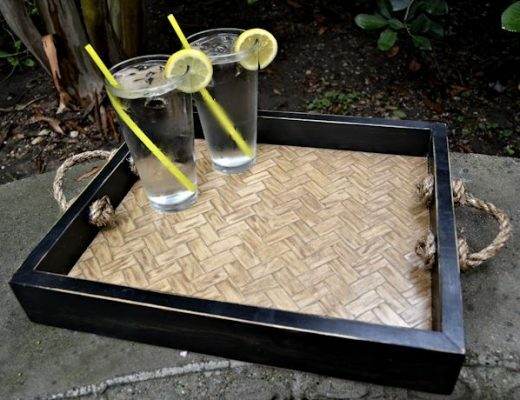 I have been thinking of doing something like it with a serving tray. Your creativity always astounds me! Great idea and execution. 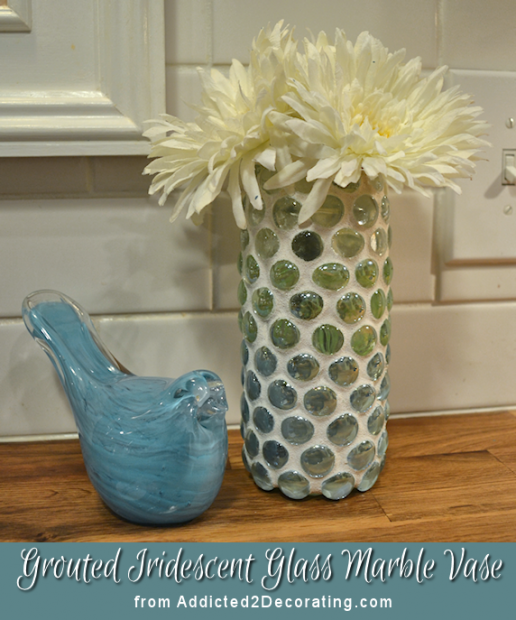 Especially like the graduated colors of marbles on the vase. Fabulous. I could see a version of this for Christmas decorations. I’m a fellow glass-jar lover. And did you know that it is far better to store leftover food in glass than plastic? That’s my excuse for saving them! Could you please provide more information about the kind of grout used and the grouting process, Thank you…Love this idea! These look great! Another great idea from your endlessly creative mind! Thanks. This is quite clever and a great use of a material we all have in abundance. I am totally making these, blogging about it and properly linking back to you! I felt like doing something fun this morning, and as I had all the items here already, I decided to give this a go. It turned out great…….or so I thought, at first. 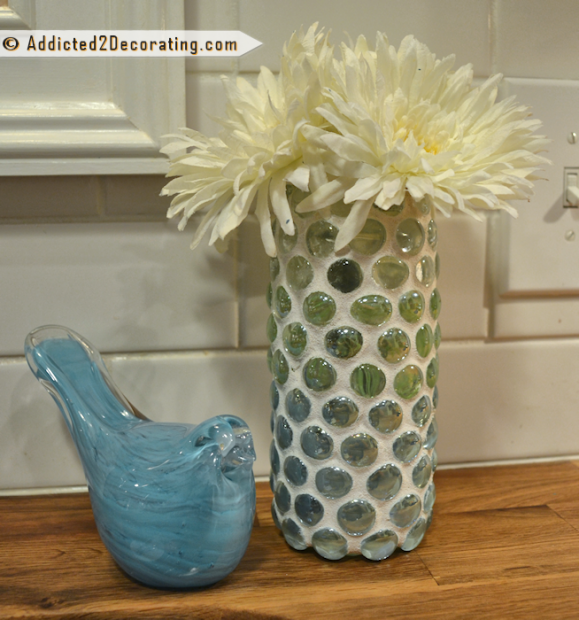 I decided to cover the jar with glass pebbles and not grout it, but as the humidity built during the day…and then I spilt water on the outside of the vase……. all the pebbles just kept popping off one at a time LOL. Oh well, I’ll give it another try again soon. These look wonderful! What a great idea, looks easy to do too. Thanks for the inspiration! You’re going to want clear/translucent marbles. Most of mine had the colored swirls on the inside, and those are fine, but if it’s a solid colored marble you won’t be able to see the cracks. I love this idea! i have some pretty blue glass pebbles that I “crackled”. the technique is easy & creates a sparkling effect. 1 ~ Preheat your oven to 500°F. 2~ Place your marbles or glass pebbles on a pan and bake for 20 minutes. 3 ~ Prepare a metal bowl with water with ice in it. 4 ~ As soon as you take them out of the oven place them in the ice water. You will hear them crakling, after a few minutes remove them from the water and admire your project. On occasion, I will have a few pieces that have crackes all the way through. but for the most part, you will find smooth pieces on the outside with crackle just inside. You will hear them crakling, after a few minutes remove them from the water and admire your project. On occasion, I will have a few pieces that have crackes all the way through. but for the most part, you will find smooth pieces on the outside with crackle just inside. OMG!! What a wonderful idea!! I keep all my glass jars for reusing them . Left over pasta sauce…etc. Now I can make them beautiful! I tried this but wasn’t able to grout with hands obviously. Did you use that bottled grout? Is it sanded or non-sanded? I am so sad but want to give it another try? I am wondering how did you fill up grout in this small space? I’d really like to be a part of community where I can get responses from other experienced individuals that share the same interest. If you have any recommendations, please let me know. Thanks! 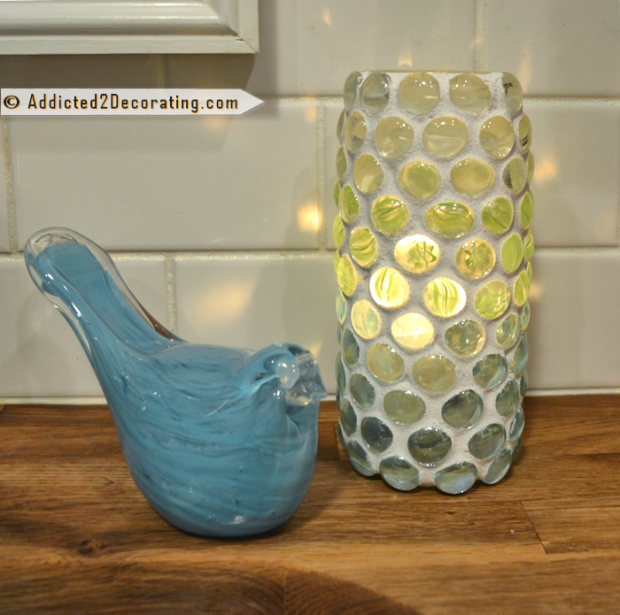 We’ve made these before, but we didn’t grout them, we just used hot glue. And like you probably already knew, that doesn’t work. They just kept popping out. We will have to try it again, this time using grout. But we did use short strands of battery powered twinkle lights instead of candles. They they worked great to illuminate the whole jar. Thanks for all your inspiration!!!! Oh, I love the idea of using the battery powered twinkle lights! I always forget about that option. It would definitely give more light than the little candles. 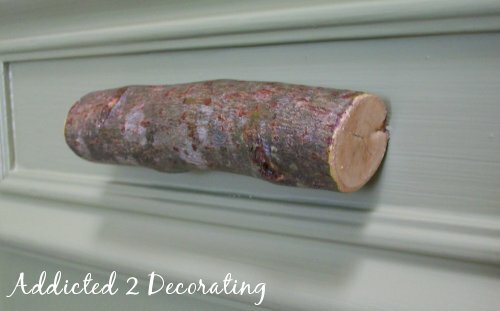 What a great idea for outdoor decorating, like for a party or even an outdoor wedding. I love your work. What kind of grout did you use? I am cusious about where you bought the marbles? And also which tools did you use to fill up the grout in those tiny spaces? I love your idea, the jars are gorgeous. I also save all of my jars for crafty projects. I think a salt lamp light kit would fit perfectly in the jar to light it up and they are very inexpensive. I’m off to buy my colored pebbles to start my new project!